Corona Labs is pleased to announce the latest public release of Corona. This new build, 2017.3184 contains many bug fixes and important new features that move Corona forward. 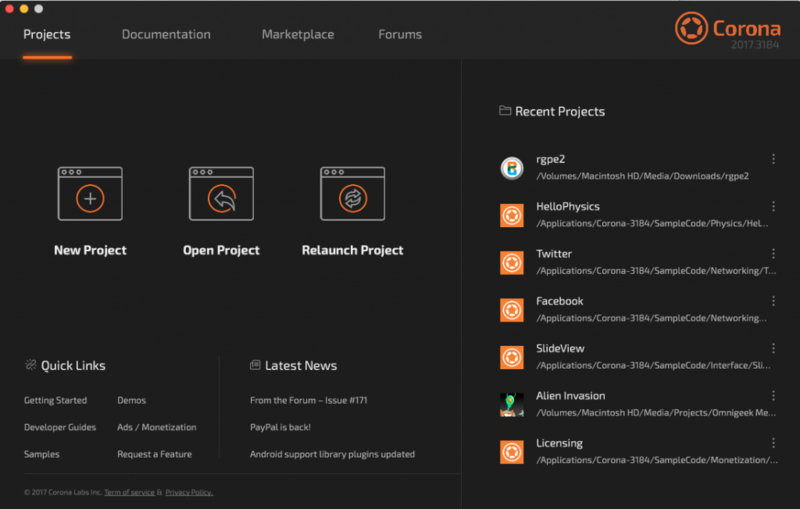 Starting with this build, Windows developers can now use Android Studio to build native based apps including building plugins, linking to native Android libraries similar to the way Mac based users have been able to do for some time. You will find a new “Native” folder in Corona’s Start menu folder, which has our standard “App” template in it. Copy that folder to your project directory and use “Open an Existing Android Studio project” option with Android Studio. These API calls are not only iPhone X aware, but they take into consideration status bars and soft button bars, so using these API calls for all devices is considered a best practice. In addition for the iPhone X, you can use native.setProperty() to control if the home indicator automatically hides or not with the "prefersHomeIndicatorAutoHidden" key. You can get the current value using native.getProperty(). Apple also changed the requirements for how icons are handled. You can no longer just include icons in your project folder and put a list of them in build.settings. You must now use an “xcassets” folder that contains the icons as well as some other important files. Please see the Images.xcassets documentation for details on setting up icons. When you first start Corona you’re presented with a Welcome Window with a list of recent projects, icons to start new projects and open existing projects. This window has been redesigned with a more modern look. Bonjour is Apple’s library that lets Corona Live Server work on Windows. Until recently, Bonjour v3 was included with the installation of iTunes. However, Apple no longer includes Bonjour with iTunes. The standalone version of Bonjour is version 2. Live Server now can use either v2 or v3 of Bonjour. Previously you could only set directions like 0, 45, 90 and 180 when constructing a gradient fill using the fill.rotation value. It can now take a number allowing you to have gradients at other angles. Windows text renderer was rewritten to better match other platforms behavior, fixing number of bugs. This public build also contains an update that addresses Corona made apps that get flagged in Google Play with the “ContentProvider path traversal vulnerability” warning. If you’re getting this warning in Google Play, simply rebuild with this version of Corona. Corona has been updated to use 64 bit Java installations. You no longer need to install a specific version of Java, just have the latest version installed. Our team recently updated the Android dependency plugins to their latest versions. See our recent announcement for details. With support for native builds on Windows and our continued improvements, this release is our best version of Corona yet. We have more to come so stay tuned to our daily builds to see what’s next for the best 2D cross-platform development framework.